Peter Miyamoto, professor of piano and chamber music at the University of Missouri, will present the final concert of the season for the Drake University Keys to Excellence Piano Series at 7:30 p.m. Monday, April 23 in Sheslow Auditorium. Miyamoto will also present a free masterclass at 6 p.m. Sunday, April 22 in Sheslow Auditorium. The masterclass is open to the public. Peter Miyamoto enjoys a brilliant international career, performing to great acclaim in recital and as soloist in Canada, England, France, Germany, Greece, Italy, Poland, Russia, Serbia, Switzerland, China, and Japan, and in major US cities such as Boston, Chicago, Dallas, Indianapolis, Los Angeles, Miami, New York, Philadelphia, San Francisco, and Washington D.C. In 1990, Miyamoto was named the first Gilmore Young Artist. He won numerous other competitions, including the American Pianist Association National Fellowship Competition, the D’Angelo Competition, the San Francisco Symphony Competition and the Los Angeles Philharmonic Competition. Miyamoto has performed as soloist with numerous orchestras, including the Chautauqua Symphony, Erie Philharmonic, Florida Philharmonic, Indianapolis Chamber Orchestra, and Knoxville Symphony, working with such conductors as Stanislaw Skrowaczewski, David Lockington, Raymond Harvey, Lawrence Leighton-Smith, William Henry Curry, and Kirk Trevor. A dedicated chamber musician, he has performed with Charles Castleman, Victor Danchenko, Joel Krosnick, Lara St. John, Anthony McGill, David Shifrin and Allan Vogel, as well as members of the Blair, Borromeo, Euclid and Pacifica String Quartets. He is a former member of the August Trio and the Beaumont Trio, and was a founding member of the Quadrivium Players, the resident ensemble at the Virginia Museum of Fine Arts. Miyamoto holds degrees from the Curtis Institute of Music, Yale University School of Music, Michigan State University, and the Royal Academy of Music in London. His teachers included Maria Curcio-Diamand, Leon Fleisher, Claude Frank, Peter Frankl, Marek Jablonski, Aube Tzerko, and Ralph Votapek, as well as Szymon Goldberg, Felix Galimir and Lorand Fenyves for chamber music. 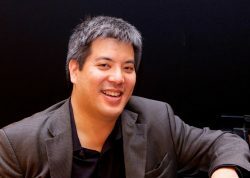 Currently professor of piano and chamber music at the University of Missouri, Peter Miyamoto formerly taught at Michigan State University, and the California Institute of the Arts. From 2003-2015 he served as head of the piano faculty at the New York Summer Music Festival. In the summer of 2018, he will teach at the Curtis Institute of Music’s Young Artist Summer Program in Philadelphia and will serve on faculty of the PRIZM International Chamber Music Festival. Miyamoto’s four solo CDs, available on the Blue-Griffin label, have received excellent reviews in periodicals such as Gramophone, International Record Review, Fanfare, and American Record Guide and were recognized by the American Prize. A CD of six commissioned duos for violin and piano produced by GRAMMY winner Judith Sherman is scheduled for release by Albany records in the spring of 2018. Two additional solo CDs, one of works by Mozart, Beethoven and Schubert, and the other of works by Schnabel, Lipatti and Gould, are scheduled for release in fall 2018 on the Blue-Griffin label.